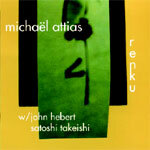 New York-based saxophonist/composer Michaël Attias makes his Playscape debut with Renku, which documents his two-year old working trio of the same name featuring bassist John Hebert and drummer Satoshi Takeishi. Named after a style of Japanese linked poetry, this trio has an intense but intricate and diversely cultivated sound befitting both its name and the eclectic background of its leader, an Israeli-born son of Moroccan parents who was raised in Paris and the American midwest. Critics write that Attias "blows with great authority and passion" (AllAboutJazz.com), recognizing his trio's "knottily vibrant compositions" (Time Out-New York) and "perpetually shifting tunes, richness of timbre, and a singular personality" (Village Voice). Renku features seven Attias compositions, as well as selections by Hebert, collectively composed works by the trio and Thelonious Monk's "Work," though the group prides itself on blurring the lines between notated music and improvisation. Renku is also the name of Attias's limber trio, which makes light, thoughtful work of his interesting group of compisitions here. Hebert (who also contributes two themes) is busy and able, and Takeishi is attractively sensitive to his best role, playing deftly but quietly a lot of the way. Attias himself plays alto with a songful, unsquealing timbre, making his long lines move with logical fluency. This is muy hip. They set up an out groove that makes me smile when I listen! ...twelve succinct pieces, arguably in line with Thomas Chapin's trio work, that center on Attias' ability to relinquish melodic fragments that flow over the top of his elastic rhythm team...this trio links their talents to provide a narrative about the diversity of ideas, moods and emotion running through their shared spirits. Like a colorful Renku, the trio recites many well-balanced verses that show the depth, creativity and raw talents of the participants. There are plenty of sax/bass/drums trios around these days, but saxophonist Michaël Attias and his trio Renku have a sound all their own, a distinctive mixture of sweet-and-sour lyricism and off-kilter stomp. Attias plays soprano and baritone, but for most of the album he’s on alto, with a lyrical but rather slippery approach that floats upwards near-weightlessly into the high registers, like an improbably cross between Lee Konitz and Marty Ehrlich. Indeed, you could mistake this at times for a an Ehrlich album, except that the rhythm is altogether more fractured: bassist John Hebert and drummer Satoshi Takeishi work with oddly but meticulously dispersed rhythms, like a hip-hop inflected version of Braxton's pulse-track structures; they don’t merely subdivide the beat, they pounce on it. Sparseness is a guiding principle on the album, along with elasticity and angularity. The compositional model is decidedly post-Ornette Coleman; Steve Dollar's liner notes also rightly mention Tim Berne’s Paraphrase. But Attias' alto, soprano, and baritone sound less searing than inquisitive, and even the hairy moments have a light touch. With a dulcet tone and supple phrasing, Attias is a fluid and adroit improviser. Backed by bassist John Hebert and percussionist Satoshi Takeishi, Attias employs a rhythm section perfectly suited to his needs. Takeishi and Hebert are a rock-solid pair and their sensitivity to dynamics make this album a prime example of excellent rhythm section interplay. Complete with knotty arrangements, and upward movements, the trio makes it all seem so effortless. While technically avant-garde, Attias does not neglect melodic development, close interplay with his sidemen, and swinging in his own fashion. His originals contain their share of variety, particularly in setting moods, and his playing clearly inspires that of bassist John Hebert and drummer Satoshi Takeishi, and vice versa. Well worth exploring by modern jazz listeners. Sax/bass/drums trios often sound like a quartet missing a member, but Renku manages to come across as complete and self-contained. Throughout the recording, Attias demonstrates rare skill and depth on soprano, alto, and baritone saxophones. He's capable of extremes, but he tends to avoid the brashness so often associated with the kind of form-based free exchange in which the trio regularly engages...a collective sound—on one hand spare, on the other surprisingly full—demonstrating clear conception, even at its most liberal, and unequivocal focus. ...an emphatically cosmopolitan saxophonist and composer. ...Renku stands as an original statement spurned on by consistent invention—from the spatial free setting of "Snow" to the theme of the album's odd-meter walking opener, "Dark Net," which dissolves and resurfaces throughout its three minute performance. Attias, Herbert, and Takeishi have forged a standout recording that marks the emergence of a significant new voice on the alto saxophone. It also marks another impressive release from Playscape Recordings. Michaël's tone on alto sax is consistently enchanting and often warm, yet robust. His tunes remind me of occasionally of those by the Thomas Chapin Trio: tasty, tricky, inventive, elegant and, at times, bittersweet. This is a wonderful trio, well balanced, both melodic and exciting, tight-knit and constantly shifting in their dynamics. Both Michael's and John's writing is intriguing throughout, putting the trio through their changes and navigating the rapids with seeming ease. A most impressive debut from a triumphant trio of Brooklyn's best.